Knowledge of the structure of biological macromolecules, especially in their native environment, is crucial because of the close structure–function relationship. 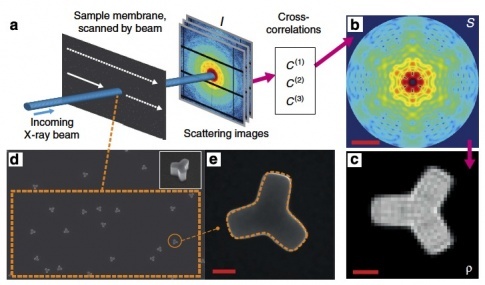 X-ray small-angle scattering is used to determine the shape of particles in solution, but the achievable resolution is limited owing to averaging over particle orientations. In 1977, Kam proposed to obtain additional structural information from the cross-correlation of the scattering intensities. results are discussed in view of proposed ‘snapshot’ scattering by molecules in the liquid phase at X-ray free-electron lasers. Figure 1 | Overview of the cross-correlation based method applied to the 2D structure determination. The flow of the protocol follows the magenta arrows: (a) the membrane carrying the gold nanostructures is scanned by the X-ray beam, and a number of scattering images, with intensities I, is acquired at different positions. The CCs (C(1), C(2) and C(3)) are calculated as averages over all images, and (b) the single-particle diffraction pattern S is computed. The red bar represents a reciprocal space momentum transfer of 0.1nm1. (c) The 2D electron density r is finally reconstructed using a phasing algorithm. The red bar corresponds to 100 nm. (d) SEM image of a small part of the sample membrane, showing the particles in random orientations. The magnification is an oblique view of a single nanostructure. The dashed orange rectangle covers an area of 146 mm2, which corresponds approximately to the X-ray beam illumination area (FWHM limit of the beam intensity in the two directions). (e) Top SEM view of a single particle, on which the dashed orange contour of the reconstructed shape is superimposed. The red bar again corresponds to 100 nm.